If you have one word to describe The Protein Bakery and what comes out it–then it’s awesome! 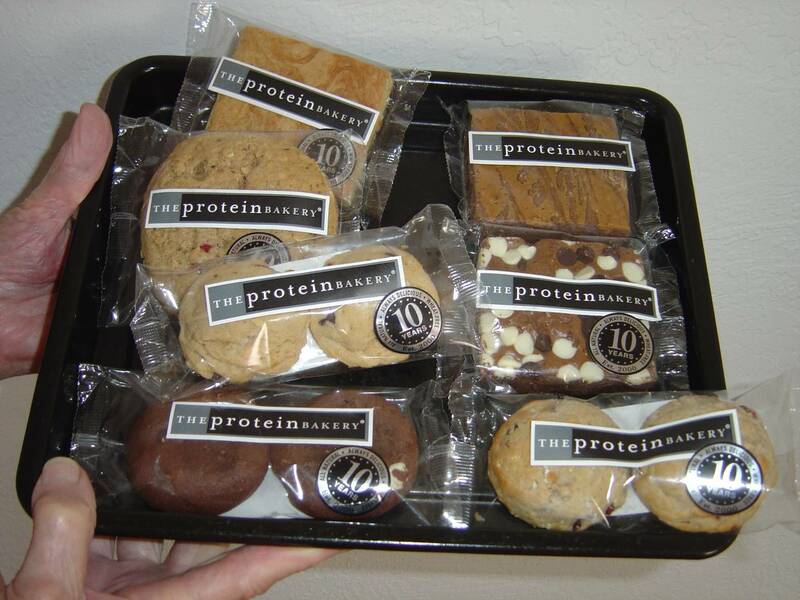 The samples of their protein-packed brownies and cookies that I was sent to review were simply incredible and bursting with flavor as well as scrumptious goodness! Owner and founder, Stephen Lincoln, a group fitness instructor incorporated his own struggle for weight loss, diet, and nutrition without sacrificing the great tasting baked goods he craved when he created his line of sinfully delicious baked brownies, blondies, and cookies you can enjoy without guilt. You won’t find any wheat in any of their baked goods. Instead, The Protein Bakery uses rolled oats, which in turn adds dietary fiber besides protein to prevent spikes in blood sugar. Describing my favorite from this batch is hard because I loved every morsel. However, if I had to select just one I think it was the brownie with both the white chocolate and milk chocolate chips. This big brownie I ate for breakfast to see how long I would be satisfied and honestly was full until lunch. If you’re on the run and don’t have time to eat, I think any brownie or cookie that they sell would be my choice over some fast food stop. Sending an assortment of their baked goods would make any holiday or occasion special. Honestly, I’m nuts about The Protein Bakery and know once your lips also savor just one bite, then you’ll be hooked on them too! Connect with them on the Web, Facebook, on Twitter, or Linked In, or on You Tube. Connect with The Protein Bakery on the Web, Facebook, on Twitter, or Linked In, or on You Tube. Chocolate Chocolate White Chocolate Chip! I follow on GFC! I follow and would love to try the Blondie Brownies. I follow on GFC and I'd like to try the Coconut Walnut Dark Chocolate Chip Blondies. I'd like to try the Peanut Butter Brownie. I would love to try the Walnut Brownie.